Most people would agree that a school garden benefits everyone involved. 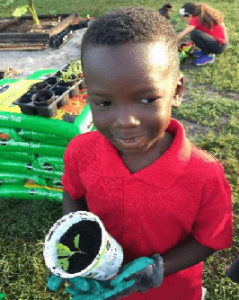 Students learn about nature and how their food is grown, participate in planning, planting, and maintaining of the garden, and take pride in their success.Teachers gain a new teaching tool suitable for many subjects – science, math, physical education and history, among others. All participants learn the benefits of working together in spite of differences in language, background or ability. Despite the many benefits, creating and maintaining a school garden year after year can be a challenge. Enthusiasm may be high during the first year, but wears thin with repetition. 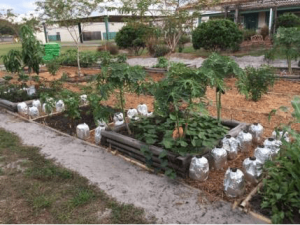 One school that has successfully maintained its garden for nearly four years is English Estates Elementary School, located just north of Orlando in Fern Park, Florida. The school is a Title 1 school with almost 800 students in grades PreK-5 and more than 85 teachers and staff members. It also has the distinction of being the 2nd school in the world designated as a Leader in Me school by the Franklin Covey Institute, in 2005. The first school to adopt this program was A.B. Combs Elementary School in Raleigh, NC, in 1999. There are now over 4,000 schools designated Leader in Me Schools and only 417 Lighthouse Schools. English Estates Elementary has since achieved the higher distinction of being named a Lighthouse School. The Leader in Me program is based on the principles outlined in Stephen Covey’s 1989 book, The 7 Habits of Highly Effective People. Its mission is to incorporate the teaching of life skills with academics in schools around the world. The garden was started in 2015 when the principal realized that a large open space between buildings needed “a tree”. Over the years, the garden has grown to include a 60’ X 25’ area of beds which produce varied combinations of beans, eggplant, tomatoes, pineapple, lettuce, strawberries, zucchini, corn, cucumbers, peppers, herbs, and many other edible plants. Adjacent to the garden area, there’s a large pergola with benches that often serves as an outdoor classroom. English Estates also has an alternate space where there are several work and storage areas for potting, composting and transplanting. The garden is a focal point of the school. Located in a high-traffic area between classroom buildings, it creates a peaceful oasis in the midst of a very lively place. 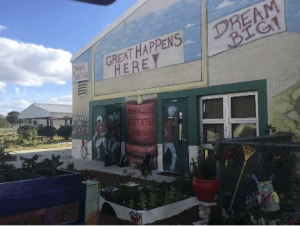 While visiting with Marie and some of her students recently, it became clear from our conversation that there are five major sources of support needed for a successful long-term school garden. It’s often said that every successful project requires a dedicated and selfless leader. Marie faithfully and patiently fills that role at English Estates. Start small and build over the years. Don’t be disappointed if things don’t happen as quickly as you had hoped. Continuously cultivate new sources of help and support. Be very appreciative of all the help you receive. Support from school administrators is key to project success. Their full support is required for a successful and sustainable school garden. In addition to being responsible for administrative decisions at their school, they are an important conduit to school district personnel. Major decisions and changes to the school’s grounds may require decisions at the district level. 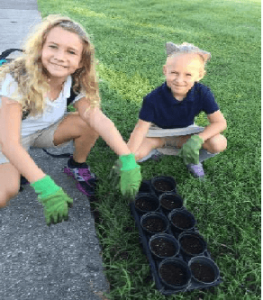 Consider that a school garden is first and foremost a place for the students (and their parents) to relax and learn about gardening. 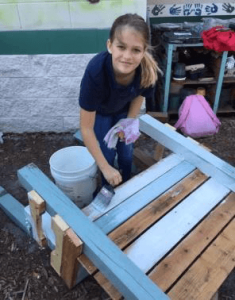 The English Estates Parent-Teacher Association (PTA) has given grant money to the garden for many purposes, including building the pergola. Many parents and other family helpers also spend time working in the garden. 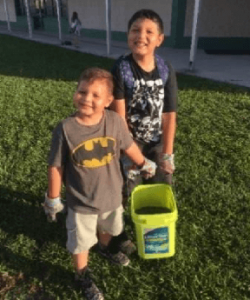 The school’s students are enthusiastic garden helpers. They plant, water, weed and harvest the “fruits” of their labor. They also keep a close eye on potential garden pests, and edibles coming to maturity. Make every effort to make people feel welcome in the garden. The garden may be enjoyed in different ways by different people. At English Estates, many teachers have integrated the garden into their lessons. It’s not unusual to see students measuring plants, writing, drawing, or enjoying other activities. 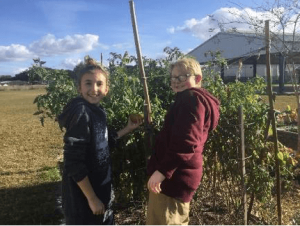 Many students, teachers, staff members, parents, and members of the community visit the garden throughout the year to see what’s growing and what’s ready to eat. It’s a great place to meet and relax with friends. There’s always something fun to do in the garden! If it takes a village to raise a child, it can also be said that it takes a village to support a school garden. According to Marie, the garden has received receives lots of support from the community. Local businesses have donated garden soil, mulch, peat moss, vermiculite, seeds and other items. Local residents have been generous in their support of the garden, too, donating two wheelbarrows, garden tools, plants, pots, mulch, and other supplies. We hope so Joe! Starting a school garden is a large undertaking that needs plenty of hands helping to get started. Thank you for this wonderful story. Marie Spoon is my sister and for this garden effort (and so many other reasons), I am indescribably proud of her!! Thank you Nancy! We are so happy to have a great partner like Marie working with us at a school! Kaydie McCormick is the Residential Horticulture Agent and Master Gardener Coordinator for UF/IFAS Extension Seminole County. 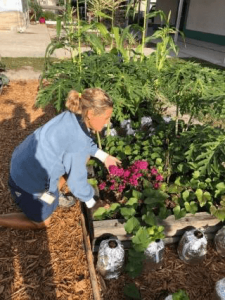 She has degrees in Landscape Horticulture Production and Design from Florida Southern College and a background in both retail and wholesale plant nursery sales.